When Gateway left North Sioux City, S.D., in the early 2000s, it left behind a talented workforce with more than 20 years of industry experience. Which was just the thing that Sterling, a growing technology solutions company, needed. Sterling Computers, now located in Dakota Dunes, S.D., began in 1996 in California by Moore’s cousin and his wife, Troy and Maggie Jones. By 2002, Moore and several other relatives had joined the family business and relocated the corporate headquarters to Nebraska. Moore and his wife, Jean, were living in Dakota Dunes at the time. Moore saw an opportunity for Sterling in the area because of the plenitude of experienced workers in the technology field. 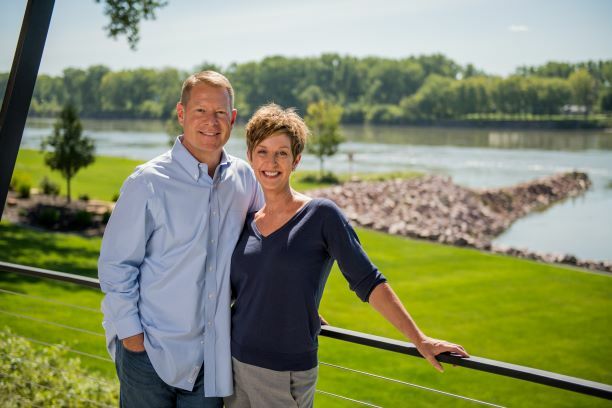 So, in 2013, the couple became majority stockholders of the company and decided to relocate the headquarters to Dakota Dunes. “We found a wealth of talent in the Sioux City area left over from Gateway and its supporting businesses,” said Moore. Unlike Gateway, Sterling doesn’t produce or manufacture technology. Instead, it takes elements that are already available and manufactured by major brands, such as Dell EMC and Cisco, and make them work better, together. For example, storage needs are on an incredible trajectory. Individuals need more digital storage space for their photos, videos and messages through their various devices. Likewise, the needs of companies and government entities are growing, too. The federal government, which is the company’s largest client, captures data from numerous collection points and needs a way to sort, retrieve and secure that data in a cost-effective, accessible and secure way. Sterling acts as a one-stop-shop, combining products, assessments, and an in-depth knowledge of specialty IT practices to install and deploy technology solutions to customers across the US. As the largest technology company in the state, Sterling has won numerous industry awards and recognitions. The company was recently named Dell EMC’s Partner of the Year, a distinction it’s earned twice in the last four years. It has also won an equivalent recognition from HPE and has been featured on Washington Technology’s Top 100 List of Government Contractors as well as the Inc 5000. In 2018, the company claimed the No. 1 spot on the prestigious Air Force contract, NETCENTS-2. And, while Moore credits much of the company’s success to the workforce, he also credits South Dakota’s favorable business climate, tax structure, ease of doing business and quality of life. Moore said that while former Gateway employees make up much of Sterling’s current workforce, he has also been very successful at recruiting nationally and getting people to South Dakota. Next on the horizon for Sterling: an expansion project. The company has outgrown its current facility and headquarters, and has acquired an 82,000 square-foot, two-story office building in North Sioux City. The kicker? The building is part of the former Gateway campus. There have been some smaller companies in parts of the building in the time between Gateway’s occupation and Sterling’s acquisition, but for the most part, the facility has been untouched. Moore says that they are currently in the middle of the design process and hope to start construction in July. Sterling currently employs 150, but the new facility will be built for 250 to accommodate future growth.